It seems like a long time ago now, but around here garage sale season started in late March. The winter was mild, causing folks to clean house and start selling early. One of these early garage sales turned out to be pretty memorable. Not just because I scored a great find, but because the seller made an impression on me...and not in a good way! This particular garage sale was held at a townhouse on a crisp, cold day in late March. The early morning temperature hovered in the thirties-brisk weather that some people might call freezing, but I like to call invigorating! With a winter cap pulled snug over my ears, I pulled into the townhouse community looking for the garage sale. It was a tightly-packed neighborhood, the type where the driveways and mailboxes are practically on top of each other. Once parked, I walked up to the sale and found quite a little scene going on. The seller was a very loud, boisterous women who seemed more interested in socializing with neighbors then actually running a garage sale. What really shocked me was how incredibly loud the women was at 8 am in the morning! Have you ever noticed how in cold weather sound seems to travel further? Unfortunately for this lady's neighbors, that meteorological phenomenon was in full effect. With every annoying shout-out, the women's voice echoed loudly between the townhouses! On what normally should have been a quiet winter morning where the only sounds heard are geese honking overhead, this women's voice carried like a foghorn! I felt bad for her sleepy neighbors who had to wake up to this noise pollution. Looking to get out of there as soon as possible, I made a quick sweep of the driveway and spotted a clear Tupperware bin. The bin was full of Lego pieces. 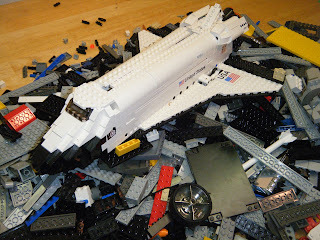 Popping off the lid, I discovered a Lego space shuttle set! Loud seller not withstanding, things were now looking up! I've had some major hits with Legos, including a Harry Potter set that I sold for close to $300 big ones! Although not as sought after as the Potter Lego sets, I knew I could make some money on this very cool space shuttle. The seller's social party was still going full-tilt, so I waited patiently as she concluded one of her many conversations with a neighbor. Finally seeing my opening, I pointed to the Tupperware up and asked how much? Miss Block Party seemed to care less, telling me she'd take five dollars for the container. Five bucks? The Tupperware container alone was worth 2-3 times that! I didn't even bother negotiating. I quickly handed over a five spot and headed back to the peace and quiet of my truck. Since my winter inventory was running low, the Lego space shuttle went on eBay almost immediately. The auction proved once again that almost any Lego set will do gangbusters on eBay. The Lego space shuttle went into orbit, selling for $61 dollars! Loud seller or not, making over fifty bucks on a quick sale was an excellent start to the garage sale season! At a community sale the other day a younger couple had set up a few items in the yard near the house. All fine and good, but I guess hubby decided to promote his DJ/Balloon business near the road. So, not only were there a million balloons shaped as arches and animals, but bad kiddy rock playing out of massive speakers. They could have been giving away gold. No way I was taking my three year old up a driveway where I would never get her to leave without a balloon doggy (which he was SELLING for $2) and bleeding ears. No Thank You!! Amber-Ha! I don't blame you for not going up the driveway. You're there for garage sale deals, not an overpriced balloon doggie! I hate it when the seller tries to multi-sell! They need to stick with the household goods! Thanks for writing in....Dude! There are so many annoying sellers. Like the ones that insist on telling where they got there items, how much it cost them, how much the item meant to them, how much it would be worth online. And all you wanted to know was how much they were selling it for. Veronica-Amen! The people who tell you what the items sells for on eBay is my all-time favorite. I want to say to them, "If you want to get eBay prices, then sell it on eBay...not at your garage sale!" My second favorite is the "price check" seller. When you ask them a price, they have to shout to their husband, son, daughter or Aunt Mildred to ask what they want for the thing! I totally can relate here. I hear my share of "Well, on ebay it's selling for...." That pretty much tells me that there are no bargains at that sale. I would so much like to say what you said Dude: "If you want to get eBay prices, then sell it on eBay!!!" but if you plan to buy something else from them, then you got to hold your tongue (UGH!). Went to a well advertised "Estate sale" this weekend......between the lady hovering over meas I tried to go through the tupperware bin of toys and screaming a description of everything to then GRABBING the tub and movingitaway.....statingshe decided NOT to sell them because I dared to openthe ziplocbags and look inside.....I was out of there. Sad thing is she had alot of collector items....but with collector pricing and too much attachment. ...Hot in Houston! I hear ya. I've had a few "change my mind" sellers, very frustrating for sure! You did the right thing by walking out, I think I would have done the same. Since her prices were high anyway, you don't need the aggravation. There's always another deal waiting at the next garage sale! Good story,thanks for writing in....Dude! That's the worst! I'll finally find something I actually want at some of these sales and when you go to pay/check prices they say "oh, that shouldn't have been put out. It's not for sale". Ugh! I know, right? Seller remorse as they call it! If it hit's the driveway or garage-it should be all fair game! ...Dude! Several items here hit home. First, LEGO is one of my primary targets that I'm looking for (in related news, it really has to be Lego; the competitor stuff doesn't sell, whether Mega Blocks or otherwise). I've even bought a huge Lego collection for $1,100 and sold for many thousands (also my biggest single toy purchase). Love the Lego! As for social hour garage sales, I've been to a few. They are good in that no one really knows the right price and it seems everyone convinces each other that the lower price is best because "you just want it gone." So I actually enjoy seeing the multi-seller garage sales. That said, I've had friends over at our garage sale and they were welcome to bring their own stuff. So I'm very much guilty of the "Price Check." I don't want to sell someone else's stuff for less than they want, so I do check (because we haven't exchanged all the prices for all of our respective items), but yeah, I've done it. It's not so bad, so long as the owner of the sale item is right there and quick with a price. I hate when the "Price Check" person is nowhere to be found. An Under Armour golf shirt finds me !